A common confusion within the babywearing community is the difference between the different styles of traditionally Asian baby carriers. Hopefully this will clear it up and help you decide if one of these styles would work for you! Side note: These carriers are an integral part of the cultures they are from, and as such, it is our job to respect those cultures by using these terms accurately. Part of this includes not shortening the words, coming up with our own nicknames for the carriers, or hacking the words apart to form "modifiers." 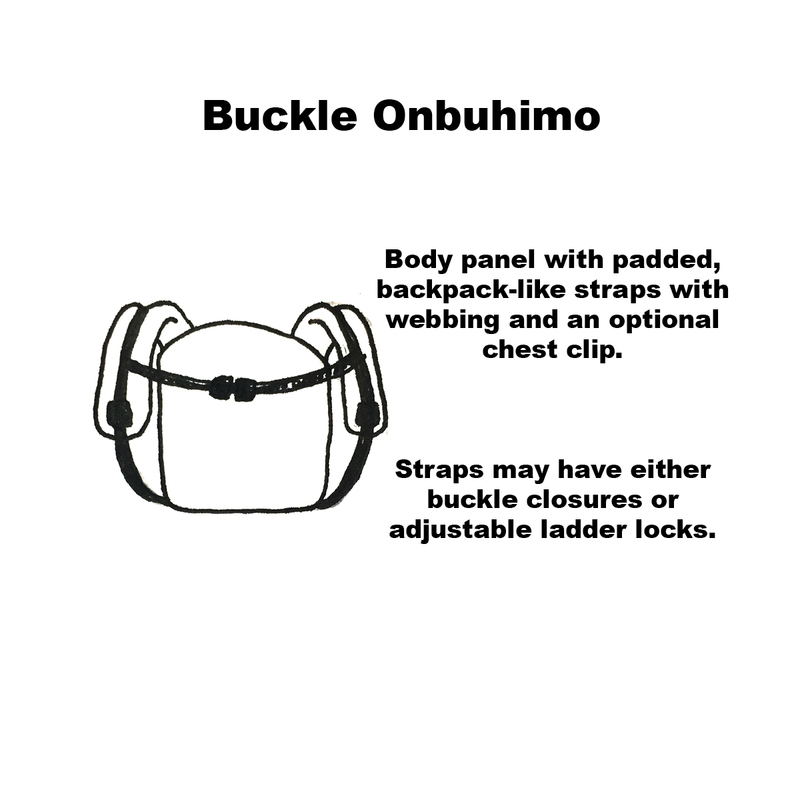 For example, an onbuhimo made with buckles is a buckle onbuhimo, not a buckle-bu. 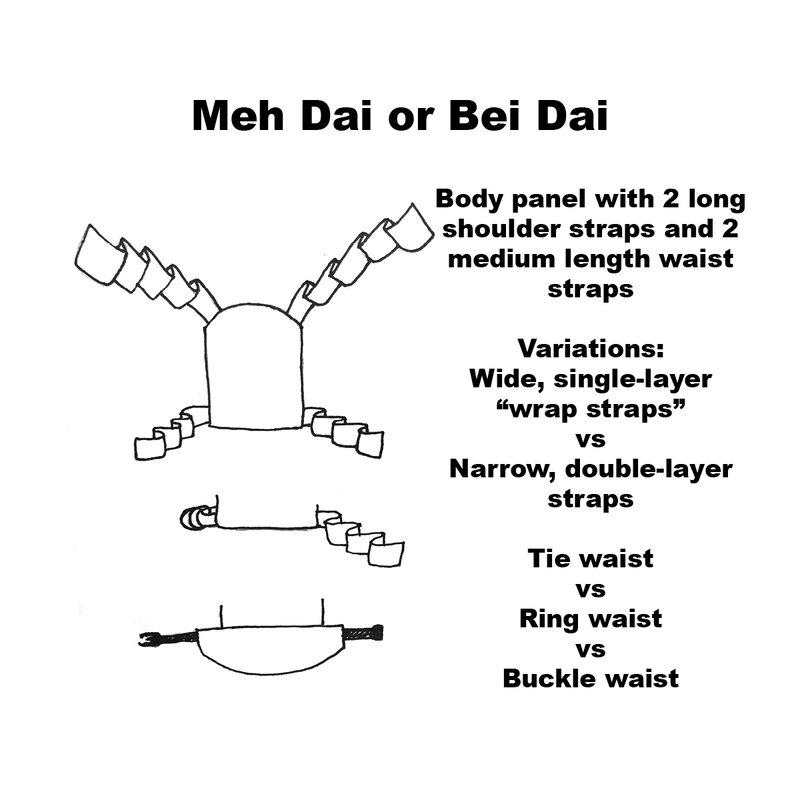 A meh dai with wrap straps is a wrap strap meh dai, not a wrap-dai or wrap-tai. Two top corners each have a long-length strap. Two bottom corners each have a medium-length waist strap. 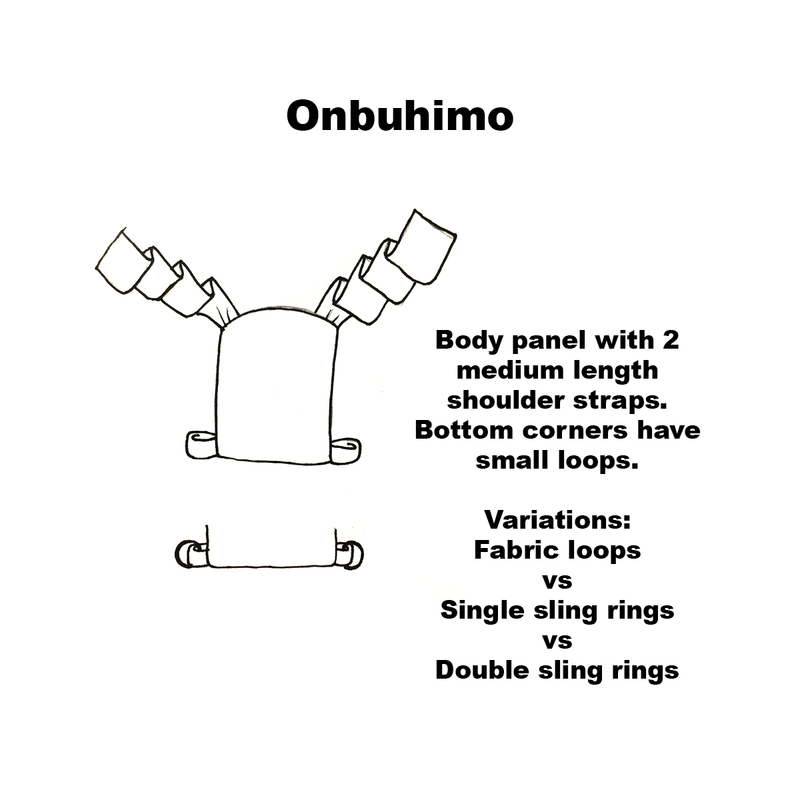 Variations include one waist strap being replaced by double rings, or the waist being replaced by a full buckle waist. Birth through toddler Good for front, hip or back carries at nearly any age, dependent on wearer's skill. If well adjusted and tightened, meh dais can be one of the most comfortable carriers for long wearing. Waist straps and shoulder straps distribute weight evenly, and long shoulder straps can be used for further reinforcement. Fairly easy to learn to use, but takes more time to put on each time. Waist strap must be tied first, which means the carrier cannot be put on while holding the baby. Takes a little more time to get all the straps wrapped and knotted. Two top corners each have a medium-length strap. Two bottom corners each have a fabric loop, single ring, or double rings. Sitting independently through toddler Designed for back carries only. Can do front carries, too, but can be awkward to thread behind your back. If worn high and well tightened, can be fairly comfortable, but puts all of the child's weight onto the wearer's shoulders. This may mean the back muscles may need to work up to being able to wear for longer stretches of time. Longer shoulder straps allow for more supportive tie-offs. Moderate learning curve, but fairly quick to put on once the wearer is comfortable with it. Two top corners each have a short, typically padded strap with two sling rings attached near the ends. Two bottom corners each have a medium-length strap. Sitting independently through toddler Designed for back carries only. Can do front carries, too, but can be awkward to thread behind your back. 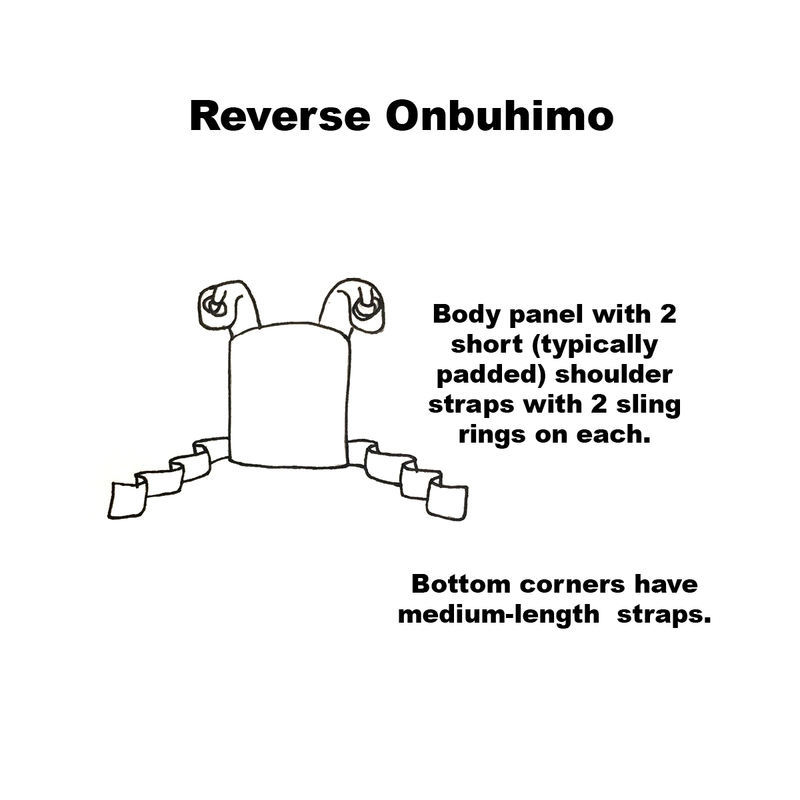 A reverse onbuhimo with longer bottom straps can allow for more supportive tie-offs to assist in weight distribution. Moderate learning curve, but fairly quick to put on once the wearer is comfortable with it. Each top corner is attached to the adjacent bottom corner by a padded back-pack like strap with webbing. Straps are connected by a chest clip. Variations include buckle closures or ladder-lock adjustment. Sitting independently through toddler Designed for back carries only. Can do front carries in a pinch. Front carries easier with buckle-closure (as opposed to ladder locks) which allow the straps to be crossed in the back. If worn high and well tightened, can be fairly comfortable, but puts all of the child's weight onto the wearer's shoulders. This may mean the back muscles may need to work up to being able to wear for longer stretches of time. Moderate learning curve, but extremely quick to put on once the wearer is comfortable with it. Can be tricky to learn how to wear baby high enough. 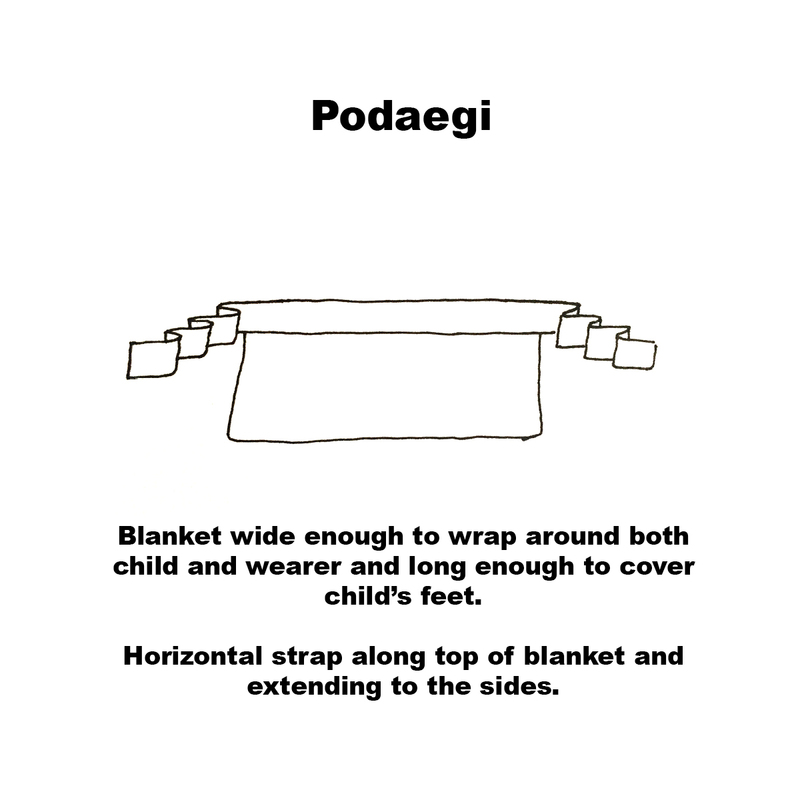 "Body panel" is an unstructured blanket wide enough to wrap around both child and wearer. Horizontal strap runs along the top of the blanket and extends off both sides. Birth through toddler Good for front, hip or back carries at nearly any age, dependent on wearer's skill. If worn properly and well tightened, can be very comfortable. The unstructured, wrap-like nature of this carrier means that comfort is entirely dependent on how well it is wrapped. Moderate learning curve mainly due to scarce educational resources, but fairly quick to put on once the wearer is comfortable with it. 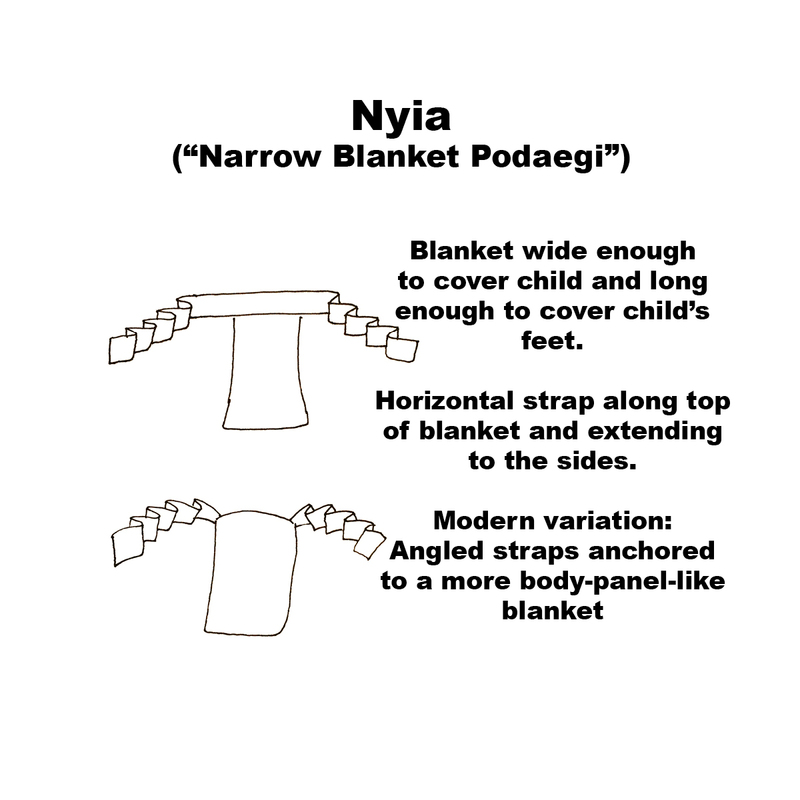 "Body panel" is an unstructured blanket wide enough to cover the child. Horizontal strap runs along the top of the blanket and extends off both sides. Modern variations include angled shoulder straps anchored to a more meh-dai-like body panel. Birth through toddler Good for front, hip or back carries at nearly any age, dependent on wearer's skill. If worn properly and well tightened, can be very comfortable. The unstructured, wrap-like nature of this carrier means that comfort is entirely dependent on how well it is wrapped. Moderate learning curve mainly due to scarce educational resources, but fairly quick to put on once the wearer is comfortable with it.